Congratulations to Round Mountain on their first place win as the Safest Large Surface Mine in Nevada for the second year in a row. 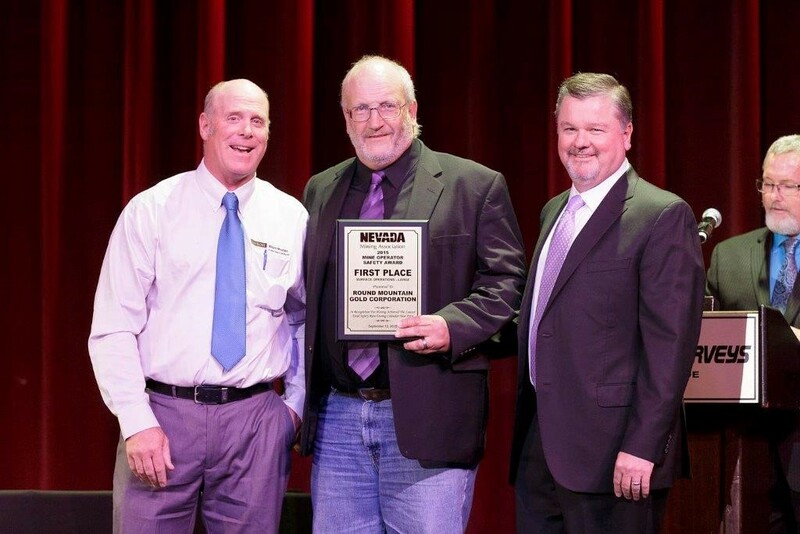 Round Mountain’s Randy Burggraff, Vice-President and General Manager and RW Carver, Health, Safety and Training Manager accepted the award in Lake Tahoe from the Nevada Mining Association on September 13th. The award was presented by Kinross’ very own Kris Sims, VP Regional Financial Officer, Americas, who was recently appointed Chair of the Nevada Mining Association. “It was very special to have the opportunity to award my hard working colleagues at Round Mountain. It was a great showing for our site among the many mining companies in the state,” said Kris. “We proudly accept this on behalf of the team. It is everyone’s daily commitment to safety that’s contributed to this win,” said Randy.